Today, we in Rockland County, and many folks around the world are “living out of the box.” What I mean by this is that our community is in a constant state of flux as we continue to become a more diverse community. Folks both migrate to and exit from Rockland County. Many come to Rockland from around the corner in New York City and from around the world from both the northern and southern hemisphere. Therefore, many of us are now living outside of the very homogenous box from where we were born and grew up. In 1970, Marshall McLuhan told us that we were living in a global village and that the world was now like a one-centered nervous system. In 2005, Thomas Friedman again explained or changed the box in which we are living by telling us “the world is flat” and that all of our boxes are part of one global society. 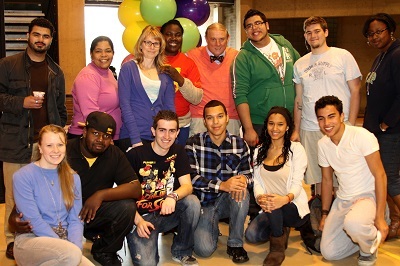 Rockland Community College embraces diversity at the core of its educational mission (RCC Diversity Statement). To meet this need in our community, I am suggesting that Rockland Community College continue its tradition of innovation and service to the community by developing two non-credit certificate programs in Peace Studies and Multicultural Studies. Peace Studies is a topic of great interest to many at the College and in the community. These groups and individuals are concerned about the level of discourse and intolerance regarding a variety of issues and the way in which members of this community interact with one another. There are colleges and universities across the country that have developed programs of study to help individuals and communities live together in peace, so we have an opportunity to do something similar for our own community. Multicultural Studies refers to courses of study in a variety of areas related to diverse communities. These areas would include history, language, the arts (music, art, drama, literature, etc.) and other aspects of culture. The college commitment has been enhanced by the fact that RCC was one of the first colleges in the country to require a course in Pluralism and Diversity. Both Rockland County and the College continue to evolve into a very diverse society. In addition to RCC students, there are many residents of Rockland County, including those with college degrees, who may be interested in pursuing courses that assist them in learning about their neighbors and those with whom they interact daily. It is my intention to appoint two committees to work in collaboration with the Division of Academic and Community Partnerships to develop two non-credit certificate programs; one in Peace Studies and one in Multicultural Studies. I am asking members of the College community who have an interest in serving on one of these committees to send me a note expressing that interest. There are also individuals and organizations in the community who may be interested in developing and assisting with these programs. It is my expectation that the committees will meet from 4-6 pm twice each month during the spring semester to develop drafts of the proposed programs for review by the College community at the end of May. Both in terms of interests and resources, it will be important to begin these programs in the fall of 2016. Programs may include existing offerings and these courses can be offered on a credit/non-credit basis. This is an opportunity to highlight existing course offerings including the array of excellent foreign language courses we now offer. The committees can reach out to others who may be interested in developing and/or teaching a course in these series; this includes current faculty and staff as well as members of the community who may have an expertise or interest in participating in these programs. If new credit courses are proposed, these courses must, of course, go through the regular College curriculum process. These programs must generate revenue to support their existence. The College will, of course, look for grants and other resource opportunities to help finance these offerings. Please do not hesitate to offer any suggestions, comments or concerns related to this proposal. I appreciate your interest and support.